The feedback received after article was unexpected. It was: If you know how to do it, why don't you do such promotion by yourself? Having a small though efficient team, I decided to take the challenge. 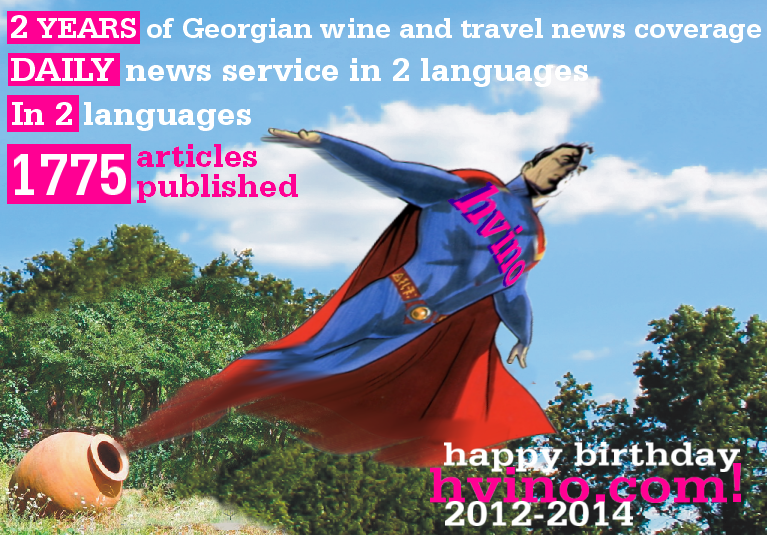 Hvino.com was launched in several weeks’ time. From the first day it offered daily English language news, business databases, legal documentation, public forum, augmented later by our own business analytics of wine sector. Our launch was welcomed by the mass media, including Georgian television and international wine medias. From the start the Hvino web portal was supposed to be a pilot of a bigger project. We developed a comprehensive and original concept for global promotion of Georgian “signature” wine and tourism, which included printed media and special events in addition to online platforms, putting Georgian wine and food in wider cultural and historical context. Our printed hi-end Hvino Magazine was particularly innovative - in terms of production, financing and distribution. Such image-building magazines are usually financed by state, but knowing that Georgian governmental funds are limited we invented an absolutely new concept. The magazine project envisaged government’s “in-kind” support – by allowing global distribution of Hvino Magazine through the Embassies and diplomatic mail. If the government helps by opening access to distribution through official channels, it not only cuts costs, but also demonstrates state-level importance of wine in Georgia, and guarantees an influential worldwide readership. 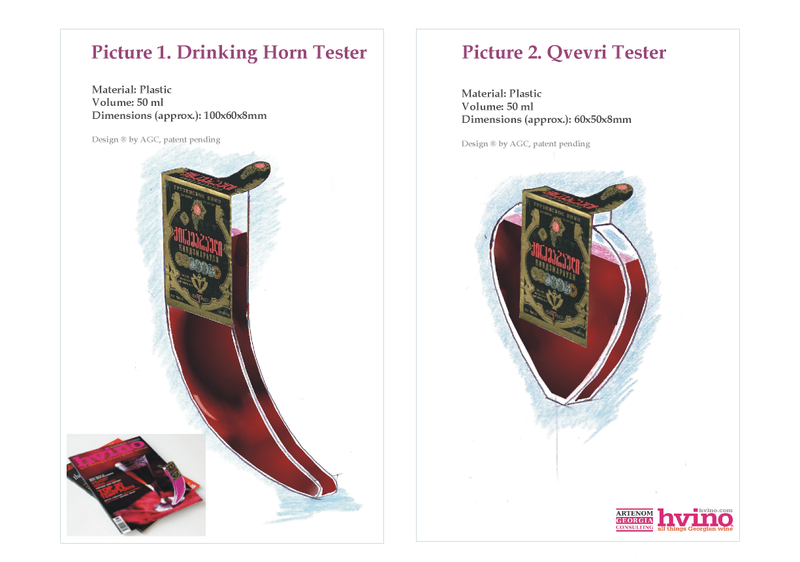 We did our best in creativity and even developed patent-pending packaging for wine testers (pictured) – in the form of ancient Georgian qvevri and traditional drinking horn. The samples were supposed to go along with the magazine as inserts. This unique feature could become possible thanks to shipping in diplomatic mail, because otherwise alcohol is not allowed in ordinary mail. The testers would have generated lots of additional attention. How has the site been doing? Hvino has immediately won popularity, which has been growing steadily since the start. Winemakers started to place commercial banner ads, helping to cover our project costs. We approached all appropriate governmental agencies and were received at high level. Everybody liked our work and our proposals; many people said they had looked forward to them. State officials promised support. The National Wine Agency asked us to produce a Russian-language version of Hvino News, and we gladly agreed. However, advertising payments were set according to Georgia's microscopic ad rates, and the Agency’s symbolic support covered just a fraction of our expenses. Meetings and talks with high-level people at three ministries had no follow-up. So our bigger projects have been suspended. The ideas for more cost-efficient and innovative promotion were put aside. Our predominantly West European team had difficult periods, not only because of the project’s financial uncertainty but also due to differences in business cultures with Georgia. But we decided not to give up and managed to overcome the problems. In fact, our team kept coming up with new ideas aimed at promoting Georgian wine. For example, we organized the first “Miss Georgian Wine Photo Contest”, widely covered in the mass media. The contest’s main prize was also innovative – an official postal stamp bearing the winning image. 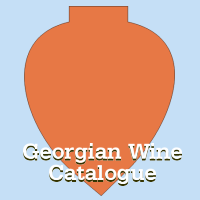 Our latest and most important innovation, launched a month ago, is the first Georgian Wine Catalogue, which essentially is a shopping guide with independent rating. So we are very active, and our sites’ stats are always showing growth. We are lucky to have many regular readers and fans - from almost 130 countries. But while our services are obviously demanded and popular, financially after two years we are at a loss. Neither my team nor myself want to close down, but financing “from a back pocket” has its limits, unfortunately. Sooner or later we must face the question how to continue running our services. I want to take this opportunity to welcome partners who share our interest in global promotion of Georgia. We have a stable successful project and a highly professional team. Let’s help each other. Looking ahead, what do you think are the biggest obstacles still facing Georgian winemakers? As I do not consider myself a wine expert I cannot talk about the quality. I just know for sure there are some perfectly fabulous Georgian wines around, and always will be. From what I can judge more professionally, I dare say that most of the problems in marketing of Georgian products, which I underlined in 2012’s article, are still in place. I have an impression that the marketing budgets – both the state agencies’ and individual companies’ budgets - can be spent much more efficiently. I have nothing against “traditional” approach, but in 21st century there are many efficient mechanisms for products promotion. Of course, there are companies, which use modern technologies both in production and in marketing, and we have many good friends in such companies. We want, however, to have more contacts with those companies who might need our professional support. After all, we see our mission in helping to make the millennia-old Georgian wine industry better prepared to face the 21-century challenges. © Source (abridged), © Hvino News | ■DRINK GEORGIAN!